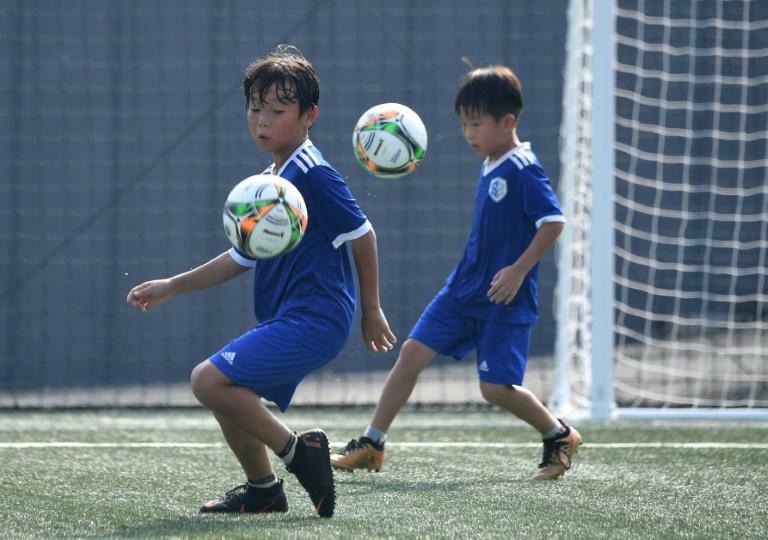 As Son Heung-min's career takes off in England, his legacy is already taking shape in South Korea -- at an innovative academy where ball control is king and shooting is frowned upon. The SON Football Academy in Son's native Chuncheon, run by his father Son Woong-jung, takes an unusual approach for South Korea where typically, training is strenuous and young players practise for up to eight hours a day. But the results of too much training too soon can be grim, says Son senior, a gifted former striker who had his career cut short by an injury he blames on overwork. "Korea's football system is obsessed with winning... so kids are exhausted from a young age," he told AFP. Determined not to let his son suffer the same fate, he kept him from joining a football team until the age of 14 and trained him on his own, focusing on fundamentals. So when his peers were playing 11 on 11, Asia's future superstar worked on mastering basic skills –- ball control, dribbling and passing –- and for no more than two hours a day, to prevent burnout. It paid off: the 26-year-old forward is among the few players who can comfortably shoot with both feet and recently signed a new five-year deal with Tottenham Hotspur after emerging as the top Asian scorer in Premier League history. Now the older Son is applying the same philosophy to dozens of teenagers attending his academy in Chuncheon, a small city about 75 kilometres (47 miles) east of Seoul, where Heung-min spent his childhood. The 56-year-old has big plans for the SON Football Academy, hoping to expand it to eventually include a school, soccer pitches, futsal facilities, a gym and a museum dedicated to his son. With a strong emphasis on fundamentals, the training programme offered at the academy is as good as the one he used to teach his son, "if not better", Son said. More than half the student body is over 15 years of age -- and none has been taught to shoot yet. "Maybe in two years," Son said, adding that practising shooting too early could strain the muscle tissues and later cause knee dislocation. The repetitive routines and seemingly slow progress do not bother students like Ryu Dong-wan. "My handling of the ball has become much more accurate," said the 16-year-old, who hero-worships Heung-min. Although Heung-min no longer requires private training from his father, the older Son is always by his side, analysing his play after each game. It has always been this way: when Heung-min took the highly unusual decision to leave school at 16 to join Hamburg SV's youth academy in Germany, his father accompanied him. "I stayed in a cheap motel across the academy and would wake him up early in the morning... for weight training before he left for team practice," Son said. He has devoted his life to supporting his son -- who has often attributed his success to his father's dedication -- and expects the parents at his academy to do the same. "I always yell at the parents," Son said, chuckling. "Whether it's golf or tennis, in whatever area, parents who raise a successful child are different," he added. Many of his students' parents, who look up to the coach as a role model, visit the training grounds every day, watching their sons repeat basic manoeuvres in scorching temperatures. Soccer mum Jung Hee-suk did not hesitate to move her entire family to Chuncheon -– a requirement to enrol in the academy –- in the belief that she was putting her son in the best hands. "He has decades of know-how," she said. "He knows football better than anyone else." The eyes of South Korea will be firmly fixed on Heung-min, their stand-out player during the World Cup, during this month's Asian Games in Indonesia. While lacking the prestige of the World Cup, the tournament could be career-changing for Son, as the team can expect exemptions from South Korea's 21-month military service if they win gold. But Son's father said the prospect of avoiding military service was "secondary" compared to the opportunity to make his country proud. "Of course, if we win a medal and Heung-min benefits from it, it will be a win-win for the country and for us," said Son senior who, of course, will join his son in Indonesia during the tournament.